Oakland is one of the most unique cities in the bay area. While some may be scared away by it's dicey reputation, there are plenty of great and fun things to to there. Oakland is a cultural hot spot in Northern California and has a plethora of vegan and veg friendly options. I'm really lucky that Oakland is in my backyard so I can share all of the amazing vegan options with all of you! Timeless holds a special place in my heart. This all vegan coffee shop and bakery has a very special feeling about it. It's a coffee shop, as I've mentioned, but it doesn't try too hard to have the "coffee shop feel." It's a very natural environment that you can instantly feel comfortable in, even if you don't hang out in coffee shops often. I love this place so much and I'm not even a coffee drinker! I come to Timeless for the bakery, hot chocolate, soft serve ice cream and small meals. Everything is to die for and I always want to stop by when I'm in Oakland. Above is the hot chocolate that I adore, you can taste the comforting chocolate but it's not sickly sweet so it goes well with anything else you are ordering there. I am a huge fan of biscuits and gravy, so when I called Timeless one Saturday morning and they told me they were serving biscuits and gravy, I immediately got out of my PJ's and headed up there. They were awesome to say the least. We also got a cheese and pesto roll that my husband said was to die for. UPDATE: Before I finished this post, we made another trip to Timeless, so I was able to add a few more items to share with you you all! My husband had the cheddar and broccoli quiche, which he inhaled, so I'm guessing he enjoyed it thoroughly. My treat was the apple walnut tea cake, which was completely lovely and tasty. Also, the holiday season is a very special time of year at Timeless, already they have mini pecan and pumpkin pies, which we couldn't resist getting. They were SO cute and took me right back to white Christmas's growing up in Ohio. Everything I have ever had there has been great so get there as soon as you can. Souley Vegan serves some seriously yummy vegan soul food. You must go there on an empty stomach because you will need the room. Located near the iconic Jack London square, Souley Vegan is located in a popular area of Oakland with lots of other restaurants and bars. My favorite thing to get at Souley Vegan is the platter. Yes, I get the platter for myself and I don't share. This means that I usually have lunch for the next day as well. My favorites on the platter is the mac and cheese, which made my list for The Top 5 Vegan Mac and Cheese and the corn bread. My husband loves to get the southern fried and BBQ tofu sandwich. Tip: They make their own lemonades, which are great. Try one! Encuentro is a full restaurant and bar that is located not too far from Souley Vegan and Jack London Square. There website boasts simple, flavorful, organic and local, vegetarian and vegan cuisine, hearty salads, local cheeses, plates to share and entrees. The atmosphere is simple and relaxing which is a great compliment to their food. First, we tried the vegan cheese plate. These cheeses (roasted pecan, macadamia nut and sharp cashew) were all so good and went so well with the bread that come with them. I love a good pot pie. Yummy warm insides in a delicious crust. So when I saw that Encuentro has one on there menu it was a easy choice for me. I didn't like whatever green is pictured on the side but the pot pie itself was a winner. Others at my table had a panini sandwich with roasted potatoes and greens, which was loved by all. You always have to try to dessert at a new place, right? We tried the sundae and as with most sweet things it was amazing. The only problem was that there wasn't more! Encuentro is a great place to go for a nice everyday meal but it also would be a great place to go for a special occasion without completely breaking the bank. I was lucky enough to be taken to Two Mammas' by a bunch of friends for my 30th birthday. It was a great recommendation because I had never heard of the place and I'm always up for trying new places to review for the blog. Two Mammas' is a pretty small place so if you are planning to go with a large group like we did, make sure to call ahead for a reservation. Though small, the restaurant is full of light and has a intimate feel. A great environment to spend a weekend morning in. We went on a Saturday, so we were ordering off the weekend brunch menu. I ordered the veggie frittata with potato salad and it was really good portion. The frittata was great but the savory crepe was a huge favorite with my friends that ordered it. I excited to get back to Two Mammas' soon and try out more of the great food they are serving up! I finally made it to Pepples! I have been hearing about Pepples Donut Farm forever and when I was invite to brunch there with a few friends, I was on board immediately. Pepples is really set up for people to come in and order their donuts to go. They have some seating but it tends to fill up quickly. Once it does, they will start a waiting list for a table. While Pepples is known for their donuts, they do serve food as well. We were there for brunch and while I wanted to try everything they had, I went for the classic pesto scramble. I wish I could say that I was blown away, but the scramble was seriously lacking in flavor. The pesto scramble is the usual order for one of my friends who said it is usually much better, so maybe it was an off day. Sadly, My husband was equally unimpressed with his chik’n waffle. Now this review isn't all doom and gloom. Pepples Donut Farm definitely saved the day with, you guessed it, their donuts. They have a large array of flavors to choose from. You will have a hard time narrowing down which ones to try. I tried the orange creamsicle donut and my husband had the Mexican hot chocolate donut (pictured.) These were out of this world! Their donuts is where they really shine. 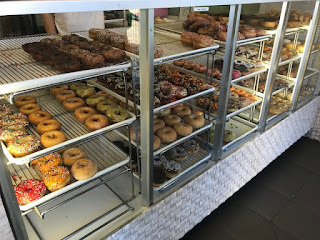 So if you are in the mood for donuts, this is definitely a place you want to check out. If you are looking for more of a brunchy type meal, try one of the other great places to have vegan brunch in Oakland. Hella Vegan Eats has been a insanely popular food truck in the bay area for years now, so when it was announced that they were going to open a permanent location, vegans in the SF Bay Area rejoiced! They opened their doors in the cool Classic Cars West building. They have lots of indoor and outdoor seating so no matter what the weather is, you can have all the amazing vegan eats you want. It took me a while to finally make it to their new location, but now that I've been, I won't be staying away for long! Of course I wanted to try their brunch because well, there are few things better on this earth than brunch. I tried the B.L.T. breakfast sandwich which was really, really good but pretty greasy (oily?). The sourdough bread was the perfect choice to build this sandwich with and OMG it had hash browns in it. Drool. My husband had the fried chicken and waffles, which he loved. Everything that Hella Vegan Eats makes is incredible so don't be shy about ordering everything on the menu. This place is not optional if you want the best vegan food in Oakland. Millennium is repeatedly voted as one of the best vegan restraints in the world. It's former home in the lobby of a hotel was in San Fransisco in an area with an impossible parking situation. When the hotel wanted to remodel, a restaurant wasn't in the plans. Most thought it was the end of this vegan legacy but we were all very happy to learn that they were going to reopen in Oakland in a much nicer location, in my opinion. Millennium offers brunch but dinner is when you would usually frequent it. It's a low light, candle lit place that is pretty pricy. It's a special occasion type of place. The food is good and if you're up for a fancy night out at an all vegan place, Millennium is your dream come true. Here is what we enjoyed on our last trip there. Highlights are the Tamals and the Trumpet Mushrooms. People were buzzing about Bare Knuckle when it first opened in Oakland. A few friends and I took a trip up to try it and sadly we were a little disappointed. They only offer 12 inch pizzas and they are expensive for the size. They do offer a few vegan options, which of course was the reason we wanted to check it out. They tasted ok but were not worth the trip up from the south bay. They have some window seating and then additional seating upstairs. If you are in the area and really need a vegan pizza, it's a good place to stop but other than that I would try out one of the other amazing vegan options all over Oakland. Vegan Donut Gelato is an all vegan donut shop that has taken Oakland by storm. They have a huge array of donuts and you'll find it hard to choose which ones you want to take home. I'm a huge fan of their filled donuts. Whether it's cream or fruit filled, these really hit the spot. I can't leave without a few of those! They sell out on most days so it's recommended to get there early and get all the goodies you want. Vegan Donut Gelato is a great place to stop before a road trip or before heading to a gathering where you need to bring some great snacks! And Encuentro looks so good! I have never even heard of Analog. Alright - I have a to try list started! I LOVE Timeless! You really should check it out. I haven't been to Analog yet because they don't open until later in the day, but I've heard good things.